The medium is Radio is so nimble. The medium of Live Theatre is alive and mutable: there's a palpable risk. Plays exist between the audience and the performers. Man, as Aristotle writes, is “a social being” – this gathering is elemental. I wish to create a sound-driven piece that innovates live theatre sound and pushes the live stage experience. Sound-centric productions and projects in theatre are rare. Combining relatively old technology of broadcasting and binaural sound, combined with newer technologies -- live project feed and local broadcasting, I hope to effect and create a new audient/actor relationship. If I have a scene set in a city, this can be the ambient backdrop -- in 3D sound -- behind the words I speak or sing. We are in a Radio Renaissance -- there is more content than ever. (And so many pairs of headphones -- Taking advantage of these new ways we obtain information and entertainment, I want to combine sound technology and theatre to enhance and expand the imaginative, and evocative capabilities both theatre and radio. Radio today is mostly pushed through a condenser mic -- this makes the likes of Ira Glass or Garrison Keillor as close to your ear as a lover would be. They are flush on the mic, close to you. I want to research and explore the psychoacoustics and audiospositioning that was was such a part of 1930s, Golden Age Radio. In the use of live sound, I will also be broadcasting binaual sound locally during performance. Binaural sound is not a new technology -- it actually simply fell out of favor because of the use of Stereo. To properly experience binaural sound, a person has to sit relatively still and have headphones. Well, that describes most people's 9-5. It's a great time to explore binaural sound again. As for what it sounds like in comparison to stereo: here's one link for example. There are hundreds on youtube. 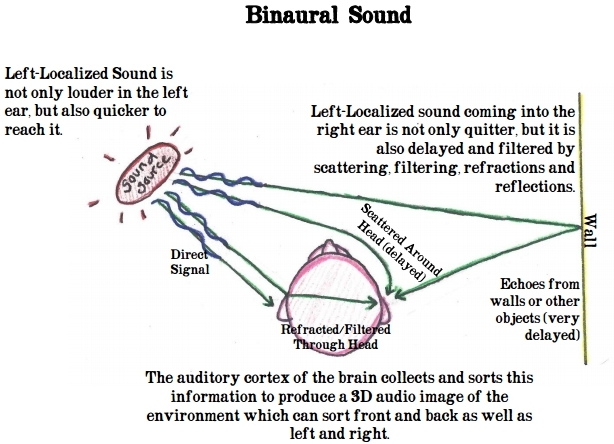 If you close your eyes you'll hear it: Binaural recordings produce 3D sound -- it has depth and 360 dimensionality. It's an oddly intimate and uncanny experience. Humans as a species may not have the best hearing in terms of sound range -- but we have the best evolved computers. I want to take advantage of this and our multi-mediated lives to create a piece that is not just biography, but a piece that delves into the art and medium of live radio. And I am going to splice in our modern technologies to cut across media -- because as technologies evolve so do the methods and possibilities of storytelling.